The evaluation of the mouth and pharynx is usually the last part of the examination of the small child. Inspect the lips for any lesions and color. Figure 24-42 A, Milk caries. B, Periapical abcesses secondary to carious destruction. Multiple caries, especially of the upper incisors, are often an indication of milk caries, also known as nursing bottle caries. They are caused by the child's going to sleep with a bottle of milk or juice in the mouth. Cariogenic fluids such as milk or sweetened beverages that constantly bathe the teeth while the infant is asleep are the cause of nursing bottle carries. 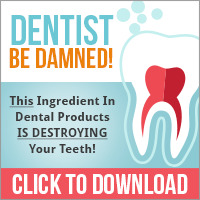 The interaction of Streptococcus mutans and other microorganisms in the mouth and fermentable carbohydrates results in acid demineralization of the susceptible tooth enamel. Untreated carious destruction progresses through the enamel, dentin, and pulp, producing periapical abscesses. The maxillary anterior teeth are the first to be affected. The mandibular teeth are the least affected. Figure 24-42A shows severe milk caries that necessitated removal of all the child's primary dentition. Always look for a small pimple in the alveolar ridge above a damaged tooth;this is evidence of a periapical abscess and necessitates urgent referral for dental treatment. The child pictured in Figure 24-42B had periapical abscesses of all her upper teeth and severe decay of her mandibular teeth. Inspect the bite. Slight maxillary protrusion is termed overbite and is the normal position; mandibular protrusion is termed underbite. Have the child bite down while you inspect the occlusion. Normally, the upper teeth override the lower teeth. Inspect the gingivae for any lesions. Inspect the buccal mucosa. In measles, on the second or third day of the disease, pinpoint white spots are often seen on the buccal mucosa opposite the lower molars. 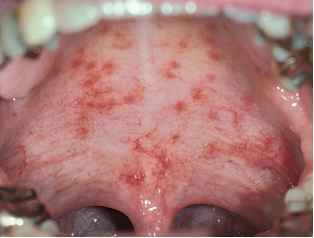 These spots are called Koplik's spots and are pathognomonic for measles. Vesicles on an erythematous base are suggestive of herpes simplex infection. Similar vesicles on the soft palate and tonsillar pillars are suggestive of herpangina caused by coxsackievirus infections. Dusky red 1- to 3-mm spots on the buccal mucosa and palate are an early sign of rubella. These diffusely scattered oral lesions, known as Forschheimer's spots, appear on the posterior hard and soft palates and develop at the end of the prodromal stage or at the beginning of the cutaneous eruption. Figure 24-43 shows Forschheimer's spots of rubella. Inspect the tongue. Geographic tongue is a normal variation (see Fig. 12-25A). Dryness is seen in dehydration and in chronic mouth breathers. Strawberry tongue is indicative of scarlet fever. Figure 24-43 Forschheimer's spots of rubella.